There are 4 classes of tantras, one of which is the Lower Tantras. We practice the Lower Tantras to clear a specific problem that obstructs us from practicing Higher Tantras. The Medicine Buddha practice belongs to the Lower Tantras and is very efficacious for medical and health problems. 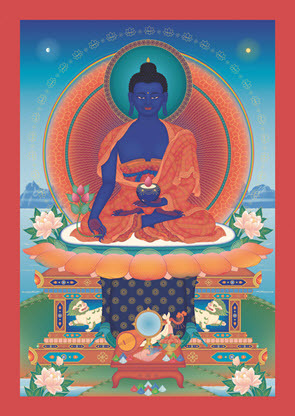 In the Medicine Buddha practice, it is twice as important to think of the Guru and Yidam as being one in nature. To remove our pain and suffering, we need the blessings of all the lineage lamas. Therefore, if we think of the Guru and Yidam as one, and if we have faith and respect in the Guru, we effectively apply this to all the lineage lamas. Place a Medicine Buddha statue (or picture) on the altar. Set up 8 sets of sensory offerings in the following manner. Starting from the back of the altar and working forward, place a row of 8 argham, followed by a row of 8 padhyam, then 8 pushpe, and so on, rather than consecutive rows of all 8 offerings. 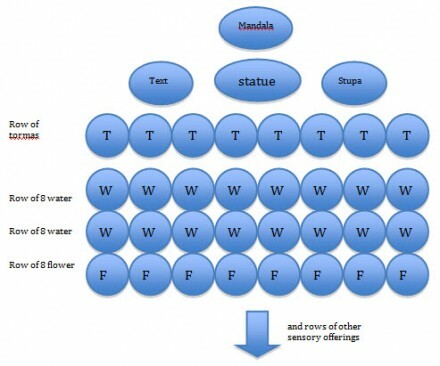 Set up additional water offerings to make up a total of 108 offering bowls. Place a Medicine Buddha Sutra text, wrapped in five-coloured cloth, on the left. Place a copy of the Medicine Buddha mandala (small or large) in a gyapi, on the altar. Place the Guru’s picture in front of the Medicine Buddha statue. Prepare eight tormas (any size) made from the 3 whites and the 3 sweets (milk, butter, yoghurt, sugar, molasses and honey) in the shape of tear drops. This practice belongs to the Action Tantras. Because of this, it is best to abstain from black foods (meat, eggs, onions, garlic), intoxicants and sexual activity on the day of the puja (before and during the puja). One should have both dorje and bell, but no damaru or inner offering. Makes even Avici’s hell-fires cool as a lotus pond. And head of the Shakyas, to your feet I bow. I’ll condense the ambrosia sutra ritual to its molten essence. Nature incorporating the entire body, speech, mind, qualities, and activity of all the tathagatas of the three times and ten directions, source of the 84 thousand collections of Dharmas, lord of all arya Sangha, I seek refuge in the kind and glorious holy root and lineage gurus. I seek refuge in the completely enlightened lord Buddhas. I seek refuge in the holy Dharma. I seek refuge in the eight brothers gone to bliss, the lord Medicine Buddhas with their hosts of retinue deities. With all the desirable perfections of both samsara and nirvana. Human and divine enjoyments: Samantabhadra’s offerings everywhere. On lotuses and lion thrones, Buddhas and Bodhisattvas abide. 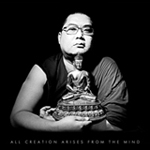 Born through the force of mantra, samadhi, and aspiration. –@ May you come here, gather, and grant your blessings. If one wishes, one can insert an extensive bath offering here. _/\_ And the maharajas and yakshas – I prostrate.